When environmental researcher and would-be writer Teena Shostekovich returns home to find her computer files stolen, she suspects it has something to do with the “hot potato” case she’s working at her job with the Florida Department of Environmental Protection. But a phone call from the thief complicates things when he suggests he can help her with her writerly ambitions. Nothing gets any clearer when Detective Logan Deo comes to her door and an unusual call from her ex-husband Mack alerts her to peril that seems a world away. 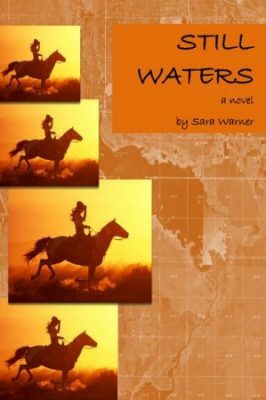 Meanwhile, the story of Jessie Weston, a cowgirl turned biologist, unfolds on the shores of Lake Ponder, where a dike her father built on the lakebed is bringing nothing but trouble from state officials, including Teena’s boss, Steve Donneroe. As Teena and Jessie’s paths veer ever closer to collision, the dangers in their lives threaten to explode beyond what either of them can understand or control, and they must work past their fears to protect the land and life they love. Finding a book that has a character with my first name was near impossible. Even trying to find books with my name spelled like Christina or Kristina was difficult and I really wanted to try and find a character whose name was spelled like mine. When I found this book with a character named Teena I had to read it, no matter what it was about. I went by Teena FOR YEARS in middle/high school and to this day some people still call me that so it was a perfect choice. I had to buy the book because neither library around me had it. It only has only been rated 25 time on Goodreads so that should tell you how obscure it is! I would say this book was ok, not bad but not great. I preferred the chapters about Jessie over the chapters about Teena. It kept my attention enough to finish it in a few days so that is a plus. I did feel like quite a bit was left unanswered, like what happens to the settlement proposal, what happens to that evil little man Bud, was Haji working alone…I guess I will never know.